Lake Sidney Lanier is a man-made lake located on the northern tip of the state of Georgia. The fishing is excellent for largemouth bass, stripers and crappie. The bass fishing in this reservoir can be very exciting especially when the stripers are busting into schools of shad on the surface. 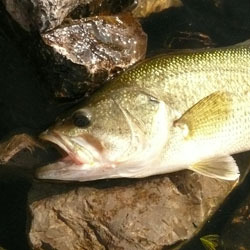 The largemouth bass start to enter shallower water in late February to until April. They stay shallow until after spawn and male bass are available as late as June. During the summer months the bass drop into deeper water and don't return to the shallows till fall. In fall they are usually located in about 10 feet of water sometimes shallower. In late fall, end of September and early October, largemouth will school with spotted bass in deeper water and can be caught by vertical jigging spoons. Good striper fishing on Lanier usually starts when the water cools off in the fall as early as the middle of October, usually lasting till March or April. A proven tactic for catching striped bass is by casting large plugs. Fishing mostly at night, anglers cast the plugs in and around points is 25-35 feet of water. A good choice of lure is the 7-inch Redfin, made by Cotton Cordell. In rougher water a shallow diving plug, in a shad pattern can be productive. Some of the best areas for striper action on Lanier are Flat creek and Balus creek, Brown's Bridge, Chattahoochee Channel in the Aqualand area and around Lake Lanier Islands. Stripers are sensitive to light and are more active on dark days and of course at night. Some hotspots are areas with permanent nighttime lights, such as near lighted docks and piers. Fishing in the shadows of these areas can be quite rewarding. This portion of Lake Sidney Lanier located north of Browns Bridge. Lake Sidney Lanier is known for its dense spotted bass population, but striped bass in the 30 lb. range dominate. White bass, white crappie and catfish are also present. This portion of Lake Sidney Lanier located between Browns Bridge and the Dam. Lake Sidney Lanier is known for its heathly spotted bass population, but striped bass in the 30 lb. range are also present. Good numbers of white bass, white crappie and catfish offer good opportunities. Each detailed map provides depth, contours, structure, boat ramps, and updated fishing information. Lake Sidney Lanier fishing maps also include lake info such as gamefish abundance, forage base, water clarity, weedline depth, bottom composition, complete latitude/longitude grid lines and dozens of GPS waypoints & coordinates.